Missouri-Kansas-Texas Railroad (1865-1988) – Familiarly called the M.K.T. and affectionately referred to as “Katy,” the Missouri-Kansas-Texas Railroad was created in 1865. First called the Union Pacific Railway, Southern Branch (unrelated to the Union Pacific Railroad,) the line was chartered by the State of Kansas to build from Fort Riley, Kansas, to the state’s southern boundary. After receiving a land grant, the company began construction in 1869. After the federal government announced that a right-of-way would be given through Indian Territory and a liberal bonus of land given to the first railroad to first reached the Territory’s northern border, other companies joined the race. But, on June 6, 1870, the Union Pacific Railway, Southern Branch won the race and officially changed its name to the Missouri, Kansas & Texas Railway. Winning the sole right to build south through Indian Territory, construction began southward and the company also acquired the Tebo & Neosho Railroad, that connected Sedalia, Missouri to Parsons, Kansas. 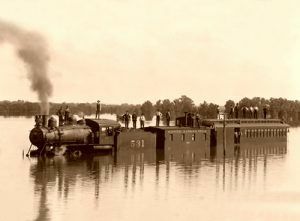 The “Katy,” touted in advertisements as the Gateway to Texas, breached the Texas frontier near the site of present Denison, where the first regular train arrived on Christmas Day, 1872. Eventually, the Missouri-Kansas-Texas Railroad grew to link Missouri’s main cities, with Tulsa and Oklahoma City, Oklahoma; as well as Texas’ large cities, including Dallas, Fort Worth, Waco, Temple, Austin, San Antonio, Houston, and Galveston. The Missouri-Kansas-Texas Railroad was purchased by the Missouri Pacific Railroad Company (MoPac), a subsidiary of the Union Pacific Railroad in 1988. By that time, the century-old company served six mid-western states with more than 3,377 miles of track. Today, it continues to operate as part of the Union Pacific Railroad system.